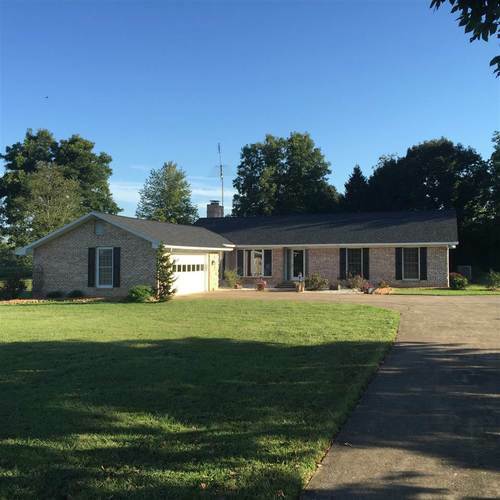 This is an expansive brick ranch with walk out basement. One owner well maintained home that is being sold on a 10 acre tract of land with a nice paved drive approx 100 yds off the road with a wooded back area that frequently has deer and turkey. Features on the main level include: main level laundry, eat in kitchen, formal dining room, master bedroom (with en suite) along with two additional bedrooms, hall bath and large family room with fireplace and extra large living room. Finished basement with 2 bedrooms, full bath, large family room with fireplace and retro bar as well as a utility room. There is a front staircase as well as one off of the laundry area at the garage entrance. The home has a new dimensional roof installed summer 2016 and new hvac installed 2015. Property includes a large pole barn as well. Directions:From the town of Lamar, IN go south on Hwy 245 two miles to CR 1100N and turn east (left) and go approximately 1 miles and home is on the right.